Pardon the illiterate translation, I never learned Greek, despite being half. That’s what I learned to say sitting at a waterfront café in the hot afternoons on Corfu, circa 1989 or so. Sense memories of hot afternoons aren’t too difficult to summon in June in central Virginia. Those of you who have been keeping up with Easy and Elegant Life for a while now know that, while not fanatic, I am a fan of good coffee. And by good, I mean strong, not bitter, not burnt and very fresh. I have my own mixture of beans that I grind at home. I use filtered water. I do my best because I drink coffee as I do whisky — neat. In this case black, no sugar. I’ll also drink hot coffee, or a demi-tasse during the day regardless of the temperature outside. But seat me outside during a hot afternoon and it’s iced coffee that I order almost without fail. Iced coffee that is a far cry from the sort that I order hot. 1-2 tablespoons of evaporated or regular milk. 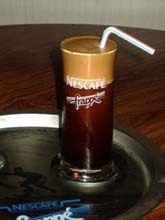 This entry was posted in Entertaining, Living and tagged Corfu, Easy and Elegant Life, Frappé, Iced Coffee, Nescafé. Bookmark the permalink. This sounds delicious! Just one question, do you add water to the shaker as well? The recipe as written would seem to result in just powder stuck to ice cubes, at least until you top off with cold water at the end. I look forward to trying this though, I have great memories of sipping that same type of drink in Manila, waiting for a plane to take me to another smaller island. Feel silly now, since it never occured to me that I may be able to make the same drink at home! i got out of the car this morning and my glasses fogged up. grrr. Nick, topping with water does the trick in the shaker. The foam rises to the top. Or you can swirl a little cold water around the shaker, pour and top up. P-D, yeah…. always annoying. Man, it’s hot. And we’ve a porch party to give this Friday! I was just wondering the best way to make ice coffee. No surprise to find it here. Many Vietnamese restaurants have a similar iced coffee (Cafe Sua Da) that is a great accompaniment to spicy Pho or rice dishes. They usually use the very cool “single person espresso press” on top of the glass with condensed milk and ice… an espresso drip into the glass. Stir and then drink. Wisco, I worked above a Vietnamese restaurant for years…. wonderful food and that coffee is a fine pick-me-up. Great iced-coffee recipe. I am definitely a coffee aficionado: fresh brewed, strong and sometimes neat. Fun post–it is only 78-80 here in LA! Thanks. An iced latte–clear plastic (to-go) cup, lots of ice, skim milk, froth, espresso poured on top, unstirred. Favorite coffee drink for summer. But freshly brewed sweetened iced tea–Grandma Dixie’s recipe (Georgia)–is the best of all. Anxious to try the recipe here! And fresh lemon and limeade? Recipes? My wife just explained the difference between evaporated and condensed milk. Golly my original questions seems a little silly now…. Nick, not at all. No worries! I get them confused all the time. I will amend the recipe to read “condensed’! Thanks! Paula, I tend to make “lemon squash”, basically muddling a half a lemon or lime with a bit of powdered sugar and topping with ice water or club soda… . Sometimes I float mint in it if the sprinkler isn’t on and I can get to the garden. I took Greek lessons back in the 70s from Alki Stereopolis. Happily, the class is on You Tube and can be seen here. tintin, beautiful. It’s the shirt that lends it that real air of authenticity. It should, of course, be worn without the blazer to highlight the skin tight blended trousers. This half-greek from NoVA (non-greek speaking too!) just made my afternoon frappe and decided to google, and wiki, and generally troll the internet for more info about my favorite summer drink and found your blog – very nice post. I have great memories of drinking frappes on many vacations to Greece. A friendly taverna owner on Karpathos taught my husband how to make them so we can recreate the vibe and buzz at home! First 00’s trip to Greece revealed the instant frappes sold at corner stores – a Greek should never be without one! Welcome Daphne! Good memories by the sip! Thanks for the travelogue.